White Fillings - Why put up with unsightly amalgam fillings? Even with the best will and care in the world, most of us will probably end up with a filling or two in our teeth. These have traditionally been filled using a material known as amalgam which consists of a combination of metals, including mercury, silver, tin and copper. Whilst this is a very strong filling material, it is also dark in colour and is very visible when we smile or laugh, revealing our filled teeth. At The Dental Centre Bedford, we are pleased to offer our patients an alternative to amalgam fillings. These white dental fillings offer the opportunity to have a strong filling, but in a shade to match the colour of your natural teeth. This filling material is made from glass particles, resin and a setting ingredient and it is ideal for the more visible front teeth and unnoticeable on all but the closest inspection. Not just a nicer smile! For patients, the most noticeable benefit is the aesthetic appeal of white fillings. On its own, this is very worthwhile, but there are other benefits too. One of these is that white fillings actually bond to the tooth, typically meaning that less of the natural healthy tooth needs to be removed in order to fill cavities caused by decay. Whilst amalgam fillings are strong, they also shrink over time, allowing tiny gaps to form on their edges. These are easy for bacteria to enter, and decay along the edges of a filling is not uncommon. 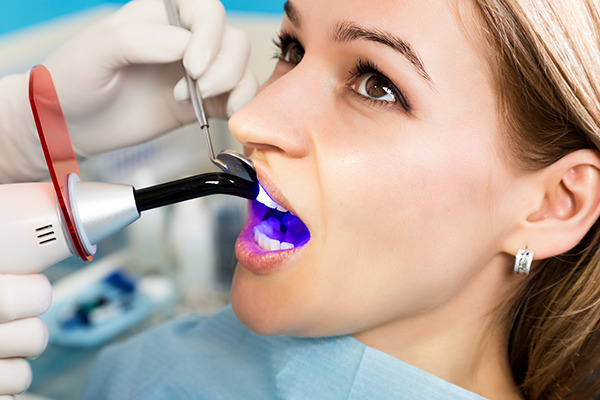 As white fillings are directly bonded to the tooth, the risk of this is minimised. If you would like to have more aesthetically pleasing fillings when the need arises, our team will be very pleased to discuss this option with you. Advances in material strength now means that white fillings can be used in a wider range of circumstances, including fillings for the back teeth which are subject to more pressure when eating food. To arrange an appointment to see one of our cosmetic dentists at The Dental Centre Bedford, please call us on 01234 819868.